It's time for zhongzi again. Duan Wu Jet 端午節 or more commonly known as Dragon Boat Festival is this Wednesday 16th June. Various pronunciations or writings for these rice dumplings. Zhongzi is a must for this festival. 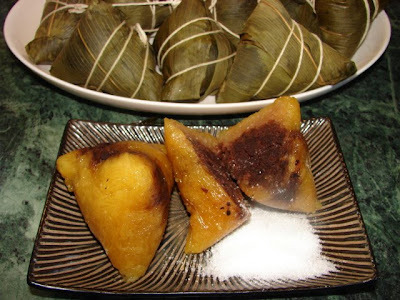 There are many different recipes for these sticky rice dumplings, more popular are meaty savoury types there are also sweet ones too usually with sweet bean paste filling. Zhongzi are similar to Lo Mai Gai (dumpling wrapped with lotus leaves). Lo mai gai use partially cooked rice wrapped then steamed. Zhongzi are usually wrapped with bamboo leaves and the dumplings are boiled from raw state for several hours. Common zhongzi shape is triangular, there are also square/rectangular. I have posted a recipe for typical Cantonese style meat zhongzi last year with clear slideshow how to wrap. Yesterday I made some lye or alkaline zhongzi 鹼水粽 (read as 'gun sui joong'). They are not the common favourite. The rice is treated with lye to give the yellow to orangey yellow colour with a distinctive acquired taste. Not many people love it, but I do, so is everyone in my family especially my mum. Lye zhongzi can be filled with a sweet bean paste (either lotus seeds paste or red bean paste) or it can be plain with no filling at all. Most people like to eat this dip with sugar or with some syrup drizzle over it. If you know how to wrap zhongzi making these lye dumplings is easy with only few ingredients. Lye (gun sui) 鹼水 or 枧水 is concentrated alkaline liquid available from most Chinese grocers. Rinse the rice then soak with plenty of water for at least 5 hours up to 10 hours or overnight. Soak the leaves for few hours or overnight till bendable, then blanch in boiling water for about 8 - 10 minutes till softened. Remove leave and soak with fresh tap water. Drain the rice using a sieve, shake off as much excess water as you can. Mix rice with lye and oil. Leave aside. Prepare the string around 85 - 90cm long each and tie into a bundle, tie to somewhere on a cupboard door handle or a wall hook for easy tying the dumplings. See slideshow on previous post. To wrap the dumplings, see the slideshow of this post and previous slideshow too. Take 2 leaves, wipe off excess water with clean towel, trim off the hard stalk, stack them on top of each other with smooth side facing up, twist to form a cone. Fill with some rice about 2 tbsp then put the bean paste on top and cover with more rice. Smooth the rice level on top. Fold the leaves to form a parcel. Then tie with string. Repeat till all the dumplings are wrapped. Each finished dumpling weighs around 130g. Take a pot large enough to put all the dumplings in, fill up to 3/4 full with water without the dumplings. Let the water come to rapid boil. Put the dumplings in, the water should cover the dumplings. Boil at high heat for 10 mins then lower heat to low and boil/simmer for around 4 hours, check every hour to ensure there is enough water . Take the dumplings out after boiling and leave to cool. Best eat warm or at room temperature, on its own or dip with sugar or drizzle with some syrup. Maple syrup is nice with this. Any left over can keep in the fridge up to a week for freeze up to 6 - 8 mths adequately wrapped. Once in the fridge or freezer, the rice will turn hard. Need reheating then cool for a while before eating. Reheat by boiling or steaming. If frozen, leave to thaw first before reheating. These lye dumplings are best wrap/tie a bit tighter (pack the rice a bit closer) than the normal meat type. If the rice is very loose before cooking, the rice will be soft and not be very nice to eat. Lye dumplings are nicer firm and a bit chewy. Do not make these lye dumplings too big. Though smaller than most meat zhongzi, the cooking time is much longer because long boiling gives the rice a deeper yellow colour. Thanks for sharing. I simply love this dumpling more then the white one. omg omg omg - I want to learn to wrap zhongzi like you! I'm going to stare hard at your photos until I absorb the technique.